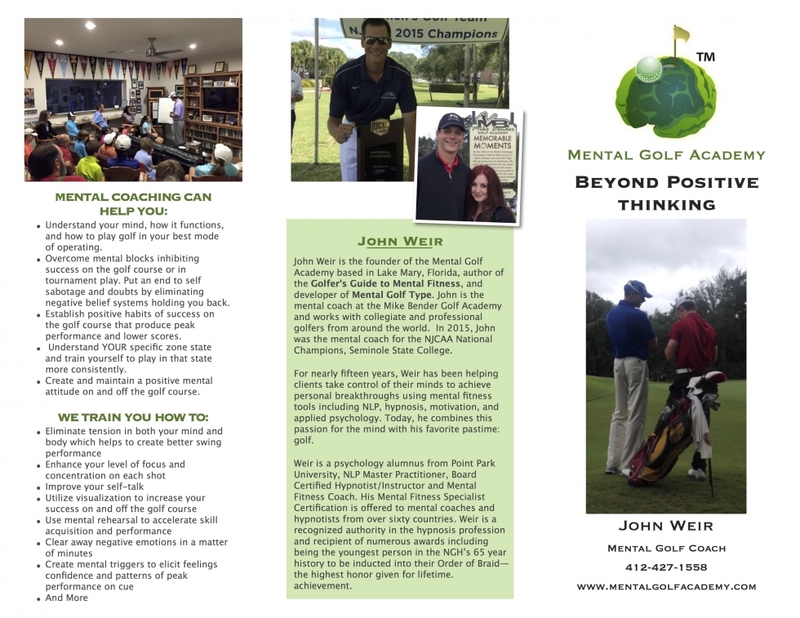 John Weir is the founder of the Mental Golf Academy based in Lake Mary, Florida and is the mental performance coach to elite junior, collegiate, and professional golfers from around the world. John is the developer of the Mental Golf Type® system, the author of Golfer’s Guide to Mental Fitness, and the creator of The Mental Caddie subconscious conditioning program. John started working with the Mike Bender Golf Academy at the end of 2014. Since then he has been the mental coach for the MBGA Elite Program, the Junior Champions Program, and many of the individual students at the academy. In addition to his work with individual players, John has also achieved success working with collegiate golf teams. 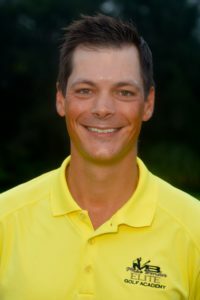 During his first two seasons working as the mental coach with Seminole State College Women’s Golf Team, the team won their first NJCAA National Championship in 2015 and was runner-up in 2016. In his first year working with Concordia University Men’s Golf Team, the team won their first American Southwest Conference Championship in 2016 and the team made their first appearance in the D3 National Championships. Throughout the years, John’s work has been featured in many media forums including TV, radio, magazines, and newspapers. Some notable features include ESPN Radio, FOX Sports, and Golf Talk Live. John had a feature article in Golfer Mag (a Scottish publication) as well as a contributor to a mental game article in the Golf Magazine October 2014 issue. John was a speaker for the Proponent Group at the 2016 PGA Trade Show and a keynote speaker at the 2015 San Diego Golf Fest. Most recently, John’s “Stoplight” pre-shot routine concept was presented on Golf Channel Academy by MBGA instructor Cheryl Anderson. For the last sixteen years, John has been helping his clients take control of their minds to achieve personal breakthroughs utilizing the most effective applied psychology and mental fitness tools. John’s diverse educational background includes: psychology alumnus from Point Park University, NLP Master Practitioner, Board Certified Hypnotist/Instructor through the National Guild of Hypnotists, and Mental Fitness Coach. His Mental Fitness Golf Certification Course has been offered to mental coaches and hypnotists from over 60 countries. John is a recognized authority in the hypnosis profession and the recipient of numerous awards including the Ormond McGill Award for faculty member of the year as well as being the youngest person in the NGH’s 65 year history to be inducted into their Order of Braid – the highest honor given for lifetime achievement. For far too long the mental game of golf has remained an elusive and mysterious things. Just about every golfer knows about the importance of a strong mental game yet very few know how to tap into this aspect of the game and train their mind to consistently perform their best on the course. Finally, the user manual to the golfer’s mind is being defined and the solution golfers have been waiting for is here at last. The path to success is different for every golfer and the idea of a one-size fits all magical formula is simply a myth. There are actually16 different Mental Golf Types, each with their own unique gifts and strengths as well as predictable patterns of stress. The key to getting the most out of your game is discovering your Mental Golf Type and “Your Path” to the peak performance zone. Your Mental Hard-Wiring: Pinpoint your Mental Golf Type and discover your mental strengths as well as specifically what you are doing when you are performing in optimal states on the course. Your Predictable Stress Patterns and Triggers: Identify exactly how your mind shifts when under stress and how it negatively effects your performance and scoring. Effective Strategies: Learn how to take control of your mind based on your unique mental hard-wiring so you can stay out of stress and consistently perform at a high level on the course. Regardless of your skill level in golf, mental training can help you immediately begin performing better, improve your ability to shoot lower scores, play with more confidence, and elevate your enjoyment of the game. If you are serious about taking your golf game to the next level or desiring a breakthrough then now is the time to make mental training a part of your development plan. Mental Golf Type Assessment: Discover which of the 16 Mental Golf Types you are through our unique self-assessment and verification process. Private One-on-One Coaching Programs: Transform your golf game with individual, personalized mental coaching that utilizes effective mental fitness tools. These sessions can be done in person at the Mike Bender Golf Academy, over the phone, or via Skype/Facetime. On-Course Mental Performance Coaching: Put golf psychology into action and learn mental skills firsthand on the golf course. Isn’t it time to finally get your mind working FOR you instead of against you on the course? Take that first step now and contact John Weir to set up your free consultation to discuss your game and learn more about the various programs to help you improve.